Cream, milk, sugar, egg yolks and vanilla extract. That’s it. Simple, old fashioned ice cream. If you’re going to eat ice cream, this is how you do it. Forget the chemicals, colorings, emulsifiers and other fillers. Stick with the good stuff. I looked at several flavors and they were all the same, just basic ingredients. Here’s the best part: this is normal. 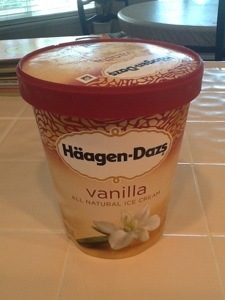 It’s isn’t some fancy “special” version, this is plain old Haagen Dazs ice cream. Very cool. Add to it that this just tastes better anyway, so all the more reason to keep it old fashioned. This is also a perfect example of progress vs. perfection. Where as many people see perfect as no ice cream and see this as “cheating” I see an opportunity for progression. Since no one is perfect (certainly not me, seeing as this is in my fridge) and most people are going to want ice cream from time to time, situations like this give us a chance to forget being perfect and simply make a better choice. Progress, not perfection. 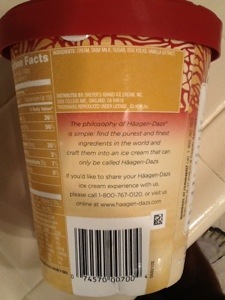 Thanks Haagen Dazs for making it easier to get a little bit better.